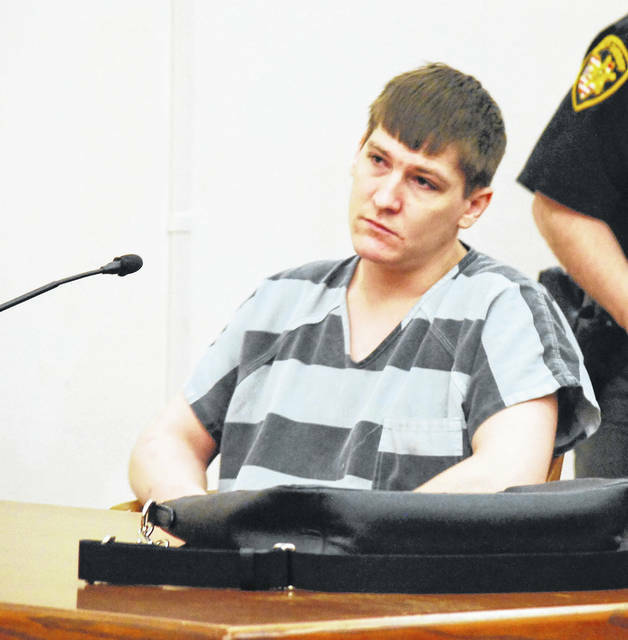 Lima resident Derek Kitchen, 26, on Tuesday waived his right to a speedy trial in Allen County Common Pleas Court. Kitchen is one of two people charged with involuntary manslaughter for allegedly providing the drugs that caused the death of a man at The Mission homeless shelter in Lima last year. LIMA – The attorney for a Lima man charged with involuntary manslaughter for allegedly providing drugs that led to a man’s overdose death suggested last week outside an Allen County courtroom that a quick resolution could be near that would exonerate his client. With all participants back in court Tuesday, it became evident that prediction would not come true. Derek Kitchen, 26, appeared in Allen County Common Pleas Court on Tuesday morning and waived his constitutional right to a quick and speedy trial. Judge Jeffrey Reed set a tentative trial date for Kitchen for Sept. 24. Kitchen is one of two persons indicted on charges of involuntary manslaughter, aggravated trafficking in drugs (fentanyl) and trafficking in cocaine in connection with the death last year of a man whose lifeless body was found at a Lima homeless shelter. Lima resident Andrea Croft, 26, has pleaded not guilty to identical charges in connection with the death of 26-year-old Shawn Hutchinson, who was discovered by staff on Sept. 6, 2018, at The Mission, a homeless shelter at 216 E. Wayne Street, Lima. According to court records, Hutchinson was found deceased on his bed with a hypodermic needle in his right hand. Detectives determined the man died of an apparent drug overdose, documents show. Police believe Hutchinson had been in contact with Croft regarding the sale of heroin and that he had asked her to bring drugs to his apartment. Detectives concluded that Croft “did knowingly furnish Hutchinson with suspected heroin and the hypodermic needle,” causing his death, according to court documents. Croft reportedly told police she had purchased the drugs from Kitchen and that he had furnished the hypodermic needle as well. Kitchen’s attorney, Kenneth Rexford, attempted to poke holes in the state’s case by saying that toxicology reports show the needle found in Hutchinson’s room contained only methamphetamine, and that there was no meth found in Hutchinson’s body. No heroin or fentanyl was found in the needle, Rexford said. “There are a lot of questions about how Derek is involved in this death,” Rexford said. Assistant Prosecuting Attorney Destiny Caldwell said the state is “confident in our case” based on information received from the Lucas County Coroner’s Office. Reed agreed to reduce bond for Kitchen to $50,000 cash or surety. The judge also denied a defense motion to suppress statements made by Kitchen to police based on “inaccurate” Miranda warnings issued by detectives.